Storing memories until next year! We are getting toward the end of another academic year and its time to ask the children to reflect on their learning this year. It's almost the Summer holdiays and time to go off perhaps to the beach .Beach huts are places to keep equipment safe until the next time you visit the beach .... and this made me think about asking the children to store language they have enjoyed this year safely ,until we come back off holiday. I like the idea of beach huts ,because they are bright colourful and can act as "piggy bank visuals" to show how we need to collect,collate,categorise and store prior learning and our new knowledge this year.Also a great opportunity for AfL for both the child and yourself! All you need are boxes with rooves, coloured in bright primary colours.The rooves need to be detachable, so you can lift off the roof of a hut and put written cards inside.Each beach hut needs a sign "nouns" or "adjectives " or "verbs" etc. The DFE POS asks us to encourage children to "broaden their vocabulary" and I think it is really important that we help our young learners to understand how you store this vocabulary, ready for use another time. So here is the idea! Ask each child needs a rectangular piece of card with which to create a postcard.Once finished they will post this card in one of the class beach huts. On one side of the card the children need to write the address. (Does the card need to be sent to the nouns or adjectives or verbs hut etc? 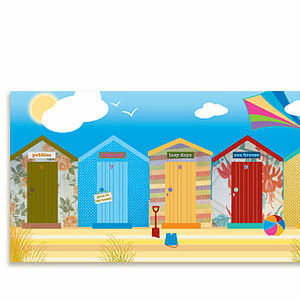 ).This means that their postcard will be stored in the correct beach hut if you have more than one category of hut. Where you normally write a message on a postcard,the children need to write down key language they have learnt and like the look or sound of this year.They need to make sure that the words are written on the correct postcard- are the words nouns, adjective,verbs etc? Each postcard needs visual symbols on the other side- drawn by the children to represent the words they have selected and want to store and have written down in their message section. With our Year 3 learners we have been focusing very much on nouns.... so let's have our own "noun beach huts" postcard collection. With our Year 4 learners we have been focusing on nouns and adjectives - so let's have own beach huts postcard collections - one for nouns and one for adjectives. With our Year 5 and 6 learners we have focused on nouns, verbs and adjectives plus we may have considered prepositions and conjunctions too. We are going to need several beach hut postcard collections. Take time to bring out cards and ask the sender to try to tell the class the words they have put on their postcard and what type of words these are. Take time to look at the pictures too. Finally discuss how we use our memories to store language and challenge the children to try to remember some of their written messages on the postcards right through until the start of school in September!